The International Max Planck Research School of Marine Microbiology (MarMic) is an M.Sc. / Ph.D. graduate program for highly qualified and motivated national and international students. 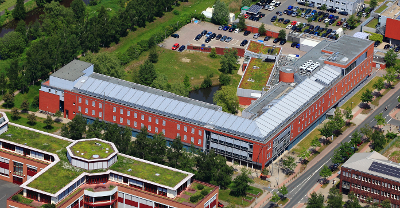 MarMic is a joint program of the Max Planck Institute for Marine Microbiology (MPI-MM), the University of Bremen (UniB), the Alfred Wegener Institute - Helmholtz Center for Polar and Marine Research (AWI), and the Jacobs University Bremen (JUB). MarMic teaches students to take an interdisciplinary approach to the understanding of marine prokaryotic and eukaryotic microbiology, offering training in physiology, ecology, evolution, molecular biology, bioinformatics, and other related subjects. Marine microorganisms are essential to the maintenance of our biosphere, yet we have only fragmentary understanding of the diversity and function of the microbial life in our oceans. The study of marine microbiology involves research of fundamental issues such as the evolution of life, the functioning of marine food webs, global climate change, the fate of pollutants, and the biodiversity of the ocean. The MarMic concept is unique: we are educating a new generation of marine scientists, and providing them with the tools to better understand microbial life and the matter in which it affects our biosphere. MarMic students are trained to think globally and to choose from both holistic and reductionistic research approaches. The breadth of theoretical and practical experiences at MarMic enables students to address questions ranging from biogeochemistry to genomic analysis, from single-cell interactions to behavior in mixed communities. These abilities make MarMic students attractive scientists for international research teams, institutes, universities, and industry.